Every day, during the month of Ramadan, Muslims around the world go through the fasting ritual and abstain from drinking or eating from dawn until sunset. They’re also encouraged to refrain from anger, envy, greed, lust, sarcasm, backbiting and even gossip. I usually take the day off on the first day of the Ramadan month to gear myself for the next 30 days of fasting. So when the freelance copywriter takes the day off (and when it’s NOT the fasting period), this is what she does. She sleeps in late (later than usual); catching up on the much needed beauty sleep she’s been deprived of after burning the midnight oil almost every night. When she finally gets up, she checks on her adorable cats first before preparing a nice healthy brunch for herself. She eats it at leisure while reading her favourite paper (the Malay Mail) or while watching TV - enjoying the afternoon in her living room, rather than in her home office. Her next stop is her home office, where she checks her emails and answers the most important ones only. She notices some clients persistently sending her jobs despite her being on leave. She winces at the thought of having to work on her day off, but she does them nonetheless so she can spend the rest of the day to herself. The freelance copywriter has difficulties turning down clients, who sometimes can be very ruthless in their demands and ridiculous deadlines. In her line of work, where her schedule is never fixed, the freelance copywriter is forced to forgo many movies that she’d love to watch but has missed out on due to her busy days and nights. So on her day off, she sometimes likes to settle down on her nice comfy sofa with a bag of cookies and catch up on all the DVD movies she bought ages ago, but never got the chance to enjoy. So she does exactly that, and proceeds to have a movie marathon, with her cell switched off. When the sun comes down and night takes over, the freelance copywriter finally switches on her cell phone to check on her messages and missed calls. She feels better if there’s only 1 or 2 missed calls, but she gets all agitated when there’s more than 5; upset that her day off was disturbed by clients refusing to believe her need for a short break from working non-stop, months at a time. Pushing all negative thoughts aside, she goes out for dinner with B, usually to one of their favourite restaurants. She feels more relaxed knowing there’ll be no new jobs waiting for her when she comes back home. After a nice dinner and night out, she stops by for a refreshing Iced Latte from Starbucks and perhaps a yummy banana walnut muffin to go with it. When the day draws to an end and her leave is almost over, the freelance copywriter begins to worry again. She wishes for more leave time but the piling jobs awaiting her tell her otherwise, so she psyches herself up for another stretch of late nights and crazy deadlines. Is it a wonder then that the freelance copywriter doesn’t update her blog as often as she’d like to? Have a great day everyone and Selamat Berbuka Puasa to all my Muslim friends! Great work station! I love! Mine is quite messy! Thanks for letting us peep into you life. Hmm, wish i could have a clean workplace like that. My comp table is now cramped full with 2 notebooks and an old P3 pc, and defies effort to put it in good ship shape. Marzie, Selamat Berpuasa. You Home office so canggih and neat. Like me, no job but play golf onli.! Yay Uncle Sam visited my home office, thank u! May I ask, if during this special time of year, if being extra picky is a criteria? ha ha ha LOL!!!!! Haha Joezul! Mine too is cramped with 2 pcs, 1 laptop, 3 tables, 2 cupboards, 1 rack, more wall racks, my paints, my books, printer, boxes + yassin's toys! Imagine! No la, cookies is for when I'm not fasting obviously. Famous Amos anyone? Colin! He he he... yeah u should see the before picture, it took me quite a while to get everything in place, if u know what I mean! LOL! Thanks for dropping by, it's always nice to see u here! Ahhh, the joys of working from home and being your own boss, you can approve you own leave forms ... LOL! I can never work from home, too many temptations like the bed for one one thing, then there's the TV, the internet, did I mention the bed already? LOL! Marzie, you have a really neat & well-organized work place. Those wooden shelfs you placed the perfume is it from Ikea. Hi Marzie .. Have a good fasting month! Your home work station is really worth everyone's envy! MMMmmmm famous amos...I like the smell of that...LOL! And yeah the shelves are from IKEA too, in fact most of my office furniture is IKEA stuff, even the table! Have a great and prayerful Ramadan! Oh, btw way Marzie, you should try the bazaar they have in urrmm, Jalan Tunku Abdul Rahman (I think that's the name of the road) the one behind Globe Silk Store. I simply think that's the god of bazaars, soooooo huge one that place. Kinda crowded though! and leave some comments to initiate the launch! Cheers! Hi Jan! Oh I have the IKEA Friends ccard, so I get free coffee every visit! :) I just love shopping in IKEA LOL! Oh yeah, that is definitely an Emila masterpiece you see, very observant! Thanks MT, I try to keep it neat and tidy but that's not always the case, esp when i'm in the middle of a big project, then my office will be in chaos! U'r Work Station is really woderful & very Spacious. all the very best sayang. Hi delirante! Thanks for coming by again! 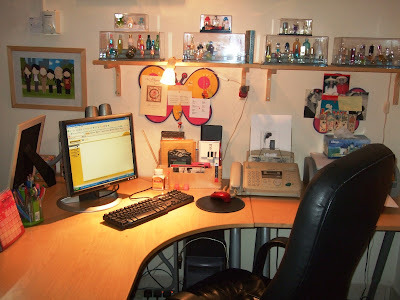 Oh, let me know when ur done posting ur desk post, would love to take a peek at your work station! Marzie, what a great work station! You see there's a picture from Emila hanging on the wall! :-D will add this on my list. marzie, your chair, it looks so comfy! OMG! I love your workstation GP! Can't believe I did not comment here..
sekarang jugak i rasa nak pi starbuck and have hot latte with blueberry cheesecake! yummy! Eh starbucks nya cheesecake sedap tak.. I love their brownie! but i don't really like brownie, lj. i like the cheesecake..
hm.. must try the cheesecake lah like that.. I need an office like GP's! Come to think of it, me too, LJ! :) Tgu lah bila dah ada rumah sendiri! :) Cannot wait lah..
i need everything in marzie's office! oh i see that you framed my illos of us bernas buddies! yay! i was first here! chop! not down here but chop up there!